The "Orion" spaceship is pushed onwards by the detonation of nuclear bombs. 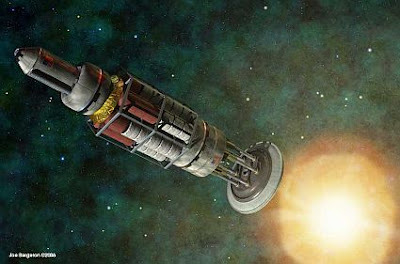 It was a concept proposed in the 1950s as a way to reach the planets of the solar system in a few days and other stars in a few years. Such ships are theoretically possible but, with the amount of energy that we can manage today, is hard to think that we can assemble enough resources for building a fleet of interstellar spaceships. On the contrary, we may well be already sliding down the other side of the Hubbert curve and we may have to give up all dreams of space exploration. Could extraterrestrial civilizations do better than us? Perhaps not. It is possible that any industrial civilization based on non renewable resources would face the same problem, we are facing: collapse generated by depletion. We could call it the "Hubbert hurdle". When I started reading astronomy books, in the 1960s, nobody knew if there existed planets around other stars and the common view was that they were very rare. Of course, that contrasted with the main theme of the science fiction of the time, of which I was also an avid reader. The idea that planetary systems were common in the galaxy was much more fascinating than the "official" one but, at that time, it seemed to be pure fantasy. But it turns out that science fiction was absolutely right, at least on this point. We are discovering hundreds of planets orbiting around stars and the latest news are that one sun-class star out of three may have an earth-like planet in the habitable zone. Fantastic! The measurements that are telling us of extra-solar planets cannot tell us anything about extra-solar civilizations, another typical theme of science fiction. But, if earth-like planets are common in the galaxy, then organic, carbon based life should be common as well. And if life is common, intelligent life cannot be that rare. And if intelligent life is not rare, then there must exist alien civilizations out there. With 100 billion stars in our galaxy, we may think that also on this point science fiction may have been right. Could the galaxy be populated with alien civilizations? Here, however, we have a well known problem called the "Fermi Paradox". If all those civilizations exist, then could they develop interstellar travel? And, in this case, if there are so many of them, why aren't they here? Of course, for all we know, the speed of light remains an impassable barrier. But, even at speeds slower than light, nothing physical prevents a spaceship from crossing the galaxy from end to end in a million year or even less. Since our galaxy is more than 10 billion years old, intelligent aliens would have had plenty of time to explore and colonize every star in the galaxy, jumping from one to another. But we don't see aliens around and that's the paradox. The consequence seems to be that we are alone as sentient beings in the galaxy, perhaps in the whole universe. So, we seem to be back to some old models of the solar system that told us that we are exceptional. Once, we were told that we are exceptional because planets are rare, now it may be because civilizations are rare. But why? On this point we should look back at some assumptions that are behind the Fermi paradox. The basic one is that there exist intelligent civilizations, of course, but there is another one that says that civilizations move along a path of progressive expansion that leads them towards the control of higher and higher levels of energy. If you think about that, this is a typical result of the way of thinking of the 1950s, when the "atomic age" had just started and people saw as obvious that we would hop from one source of energy to another. We would leave fossil fuels soon to move to nuclear fission. From there, we would move to nuclear fusion and then to who knows what. This progression is crucial for the Fermi paradox to make sense: of course it takes a lot of energy to embark in a gigantic task such as interstellar exploration and civilization. An estimate for the minimum power needed is of of around 1000 terawatts (TW) as an order of magnitude. It is just a guess, but it has some logic. The whole power installed today on our planet is of the order of 15 TW and the most we could do was to explore the planets of our system, and even that rather sporadically. similar to the ones that govern our behavior. They would tend to use the highest energy yield resources and therefore use fossil fuels as the start for their industrial civilization. Fossil fuels, however, are an energy source too weak and too polluting to use for interstellar travel. An extrasolar planet might well be better endowed than ours, but that would not help. The limits for our aliens would be the same as they are for us: either depletion or the saturation of the atmosphere with greenhouse gases (and perhaps both). But the limit with fossil fuels is more subtle than that and it is related to the Hubbert model which says that the pattern of energy production of a non renewable resource is highly non linear and follows a "bell shaped" curve. The model is based on the concept that energy production grows depending on the energy yield of the resource (energy return on energy invested, EROEI). The higher the EROEI the faster the resource is exploited. As the best (highest EROEI) resources are exploited first, the EROEI declines and eventually affects the ability of extracting more resource. Production reaches a peak and then declines. The result is the typical, bell shaped, Hubbert curve. If, in addition, the resource being exploited produces significant pollution, decline will be usually faster than growth, that is the curve will be asymmetric and skewed forward (this I have called the "Seneca effect"). The curve is general for all non-renewable resources, although it is most often applied to fossil fuels. Tim O'Reilly may have been the first to note, in 2008, that the Hubbert curve may be relevant for the Fermi paradox. Because of the non linearity of the curve, no matter what resources are being used, a civilization literally "flares up" and then subsides, being able to maintain the highest level of energy production only for a very short time. This phenomenon that we might call "The Hubbert Hurdle" may be very general and make industrial civilizations in the galaxy to be very short-lived. The decline associated with depletion and with pollution may rapidly bring a civilization back to stone age, from which it will never be able to develop again a sophisticated technology. That is an especially difficult hurdle if the Seneca behavior sets in (maybe we could call it the "Seneca hurdle"). In any case, this effect strongly limits the life-span of a civilization. Note how this model is different from the view of the 1950s. In the 1950s, we believed in a continuous expansion of energy production, "hopping" from source to source was seen as a smooth process. But the Hubbert model says hopping to a new source is, instead, a dramatic jump and success is by no means guaranteed. We may well have failed our attempt to hop to the "next level", seen as nuclear fission. With the decline of fossil power, it may be too late to gather sufficient resources to invest in nuclear energy. Intelligent aliens might do better than us in gathering these resources, but the Hubbert hurdle remains a major problem. One problem with nuclear energy is that it creates a particularly disastrous form of pollution: nuclear war. The possibility that alien civilizations would routinely destroy themselves as they entered their atomic age is something that Isaac Asimov proposed in his 1957 short story "The Gentle Vultures." But, suppose that it doesn't happen. Can nuclear fission provide enough energy for interstellar travel? Most likely not. Uranium and thorium, fissile elements, are extremely rare in the universe. For what we know, they are accumulated at levels that can provide a good EROEI only on earth-like planets which have an active plate tectonics. On bodies such as the Moon and the asteroids, uranium exists in extremely tiny amounts, of the order of parts per billion and that makes extracting it an impossible task. It is unlikely that an alien rocky planet could have much more uranium than we have on ours. So, let's make a quick calculation. Today, nuclear fission is generating a power of about 0.3 TW on our planet. We said that for expanding in the galaxy we need something of the order of 1000 TW. That's a far target for us, considering that, with the limited uranium resources available, we are not even sure that we'll be able to keep active the present fleet of nuclear reactors in the coming years. We could expand these resources to non fissionable isotopes of uranium and thorium if we were able to develop "breeder" reactors. In that case, an optimistic estimate has that the uranium mineral resources could last for "30.000 years" at the present rate of consumption. Maybe, but if we were to reach 1000 TW, we would run out of uranium in 10 years. This number gives us a rough estimate of the time span that nuclear energy could sustain a civilization at a power large enough to permit interstellar space travel: tens or perhaps hundreds of years, but not much more. Such a civilization could, in principle, generate a large spike of energy production but then it would have to quickly decline back to zero for lack of fuel resources. It is, again, the Hubbert hurdle at work. So we arrive now to nuclear fusion, the poster child of the Atomic Age. Fusion can use hydrogen isotopes and hydrogen is the most abundant element of the universe. The idea that was common in the 1950s is that with fusion we would have had energy "too cheap to meter", so abundant that we could have had week-ends on the moon for the whole family. Well, things turned out to be much more difficult than they seemed to be. In more than half a century of attempts, we have never been able to get more energy from a fusion process than we pumped into it. Even “fusion bombs” are actually fusion enhanced fission bombs. Maybe there is some trick that we can't see now to get nuclear fusion working; maybe we are just dumber than the average galactic civilization. We might also maintain, however, that there simply isn't a way for fusion to be obtained with an energy gain outside stars. Of course, we can't say, but the Fermi Paradox could be telling us, actually, "look, controlled nuclear fusion is NOT possible." Of course, there are other possibilities for a civilization to develop powerful sources of energy. For instance, think of black holes. If you can control a small black hole, throwing anything into it will generate a lot of energy that could be used for interstellar travel. Black holes are very difficult to control and a civilization using this technology would face the ultimate pollution problem: the creation of a black hole big enough that it would gobble everything around, including the civilization that created it. In any case, even black holes are subjected to the Hubbert Hurdle, as you keep throwing matter into them, you gradually run out of it. A civilization based on black holes would flare up very rapidly and then disappear, leaving nothing except black holes. Clearly, we are entering a realm of speculation but the point I wanted to make with this post is that the Hubbert mechanism generates a short lifespan for a civilization based on non-renewable resources. It also generates dramatic problems in switching from a resource to another. If this is a general behavior for civilizations, then it can explain the Fermi paradox. Sentient beings may be common in our Galaxy, but their existence as industrial civilizations may be extremely short. So, we shouldn't be surprised that we don't find alien spaceships cruising around. Perhaps we'll have a chance to get a radio signal from one of these civilizations, but that will be just like spotting another ship while crossing the ocean. There are plenty of ships crossing the ocean, but take a given moment and a specific place and it is very unlikely that one will be visible from there. In the end, the energy source available to a planetary civilization is limited to what can be obtained from the planet's sun. That may be a lot: on Earth the total amount arriving is about 100.000 TW; which can be further increased using space installations. With that, it would be perfectly possible to arrive to those 1000 TW that we said are necessary for interstellar travel. But we have arrived to a concept completely different from the one that is at the basis of the Fermi paradox: the idea, typical of the 1950s, that a civilization keeps always expanding. A civilization based on a fixed energy source, a star, may reason and behave in completely different terms. It might concentrate on the exploitation of the star (this is the concept of the "Dyson sphere") rather than on interstellar travel. As we move away from things we are familiar with, we find ourselves in unknown terrain. How would such a high power civilization manifest itself? What is in the universe that we can define as “natural” as opposite to “artificial”? The only thing we can say is that stars are wonderful engines: steady, powerful, reliable, and long lasting. If they were not natural, someone should have invented them..... But, of course, they are natural......yes...... I think they are......... .
Charlie's essay caused something of a firestorm among the cornucopian holiday-on-the-moon set, and - I think - caused him to be invited to a symposium on space travel given last month by NASA. Papers from that symposium should appear in the next few months. In principle the transition from fossil fuels to solar energy is not sufficient of itself to cause collapse, as Meadows, Meadows, and Randers have pointed out _ad nauseam_. And there is enough of a surplus to allow exploitation of the solar system by robot, at the very least. Perhaps better telescopes will allow us to find out more about Fermi's last problem. One does wonder whether deliberate creation of phenomenally dense information sources (artificial: not yet achieved by our techno-civilisation) could be attempted, and for microscopic 'clouds' with small mass, accelerated to very high extra-terrestrial velocities to cross inter-stellar space? Re-creation at the other end, if there were suitable material and energy sources, might float a civilisation, or at least its communication wing, to some far future? Again though, why has it not been done so that we noticed? Ugo, I certainly don't want to dismiss O'Reilly's well-written article, but I discussed this same point in 2007 in an Archdruid Report post titled Solving Fermi's Paradox. Mind you, it's a point well worth repeating! Yes, John, I cited your post at the end of the article. I am afraid, Ugo that I could be almost "au pair" with Tim =è Reilly, as for the first to write about the link of the crisis/peak everything and the fermi paradox. unluckly form me, i can olnly give a link to a more recent post of mine, anyway always written down in the fa far 2008...Actually I Think that this is a really important question to do once and again, as the magnitude of the challenge we are facing is uncovering in front of us, in these days/weeks<7months/years. I know am seeing that there r other precedeents written essaies. Well we can call it convergent evolution, convergenze evolutive, whatever the correct translation could be. The BEST results: the scientific method works.